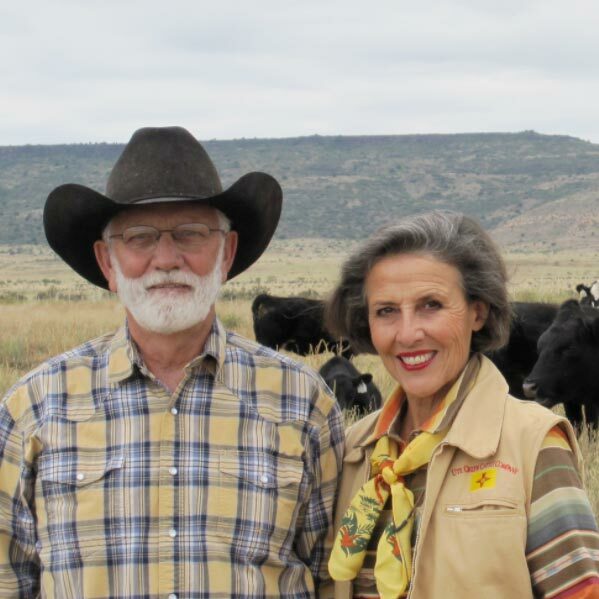 Tuda Libby Crews and Jack Crews operate an Angus cow/calf business raising healthy all-natural beef for consumers. Ranch enterprises attract a birding/eco-tourism audience to a twenty-three acre Wild Bird Sanctuary in Bueyeros. The Rectory, a high-end Bed & Bath, provides accommodations for birders/visitors in Mosquero 27 miles east of the ranch. Tuda, Jack, Libby and Ted are alumni of the Ranching for Profit School and strive to create a sustainable family business for future generations. The Crews develop wildlife habitat using cattle as a tool to enhance forage production as well as provide revenue for the ranch operation. Collaboration with NRCS, US Fish & Wildlife NM Partners Program, NM Audubon, Bird Conservancy of the Rockies and other agencies has resulted in an increase in bird species, an impressive stock water distribution system and an adaptive grazing program to support the high quality cow herd built from Gardiner Angus genetic seed stock. With pride in all they do ten ranch principles guide their management in stewardship, water and land conservation, leadership, livable communities, education and youth engagement. A decade ago partnerships forged with Ute Creek Soil & Water Conservation District, the NM Water Trust Board, NM Game and Fish, the National Wild Turkey Federation, the Canadian River Riparian Restoration Project and others focused on treating a severe infestation of invasive salt cedar in ten miles of Ute Creek on the ranch. The project serves as a regional model of effective riparian restoration, and water flows down Ute Creek year-round. A severe drought (2008-2012) made water conservation a priority. Los Alamos Labs awarded a grant to reduce evaporation loss on stock tanks. Covering the surface of one tank with a product called Armor Balls reduced evaporation by 91% and resulted in annual savings of 16,000 gallons of underground water on one twenty-foot drinker. Other ecologically-mindful water conservation includes managing the grazing program, water catchment, measuring the water table and xeriscaping. In 2006 the Crews received the New Mexico Society for Range Management Excellence in Range Management award and in 2009 received Quivira Coalition’s Leadership in Ranching award. In 2013 they were recipients of the Harry Hopson Excellence in Conservation Award from the Ute Creek Soil & Water Conservation District. Tuda serves on the board of the Harding County MainStreet Economic Development Corporation. With seven generations of her family on the land, Crews’ deep roots motivate efforts to enhance Harding County’s rural community quality of life and economic health. Their daughter, Libby Crews, is married to Peter Wood of Jackson Hole, WY. Son Ted J. Crews is married to Sadie Jo Smokey and they live in Phoenix, AZ. Grandchildren, Bella Wood, identical twins, Bennet and Seth Crews, and step-grandchildren Isa, and Sadie Smokey, grace their lives.